The classically designed Ottoman gives you a place to sit back and put your feet up after a long day. The Ottoman is sophisticated with a boxed seat cushion and exposed wood turned legs. 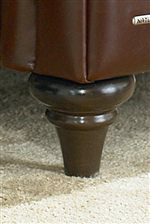 The traditional style makes the Ottoman easy to bring into any room providing comfort and style. The A297 Ottoman w/ Turned Legs by Natuzzi Editions at Becker Furniture World in the Twin Cities, Minneapolis, St. Paul, Minnesota area. Product availability may vary. Contact us for the most current availability on this product. The A297 collection is a great option if you are looking for furniture in the Twin Cities, Minneapolis, St. Paul, Minnesota area.